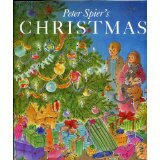 One of my favorite Christmas books is the aptly titled Peter Spier’s Christmas!. This book doesn’t have any text at all—which might seem like a challenge at first glance, but once you look at gloriously detailed, colorful and lively artwork, you realize that truly a picture is worth 1,000 words! The book goes through the holiday season with one family in the town they live in, and begins with them shopping under a sign that reads “12 days til Christmas”. The pictures go on through all of the usual preparation for Christmas: gift-buying, decorating, cooking meals. But the book contains more than the typical preparation for Christmas: it also shows the family visiting and bringing gifts to elderly neighbors, donating to a toy drive, making and sending Christmas cards (that might be a novel idea to some children today! ), setting up the nativity scene, and going to worship services. It goes on to show the joy and excitement of Christmas Day: presents, meals with family, being together in celebration. This book is also unique in its portrayal of what happens after Christmas: it shows the reality of cleaning up the house, putting away decorations, and even some sad pictures of discarded wreaths and Christmas trees. But the book ends on a hopeful note, as the town returns to normal: the image of new trees growing and a sign reading “353 days left before Christmas”. Up until I was in middle school (seriously! ), my mother read to my siblings and me every night. Usually it was just a chapter of a book, but if we picked a shorter book, she’d read the whole thing. You’d think a book without words would be challenging, but this was always one of my mother’s favorites for us to pick, and we enjoyed it, too, because she would describe every picture, making a story out of it. She’d also compare what was going on in the pictures to what we did to celebrate our Christmas (“look, there they are setting up the manger scene, just like we did”). And she saw the detail in every little picture (in the pictures of the church service, there are owls up in the bell tower, which she always pointed out, to our delight!). Sitting next to my mother and siblings, looking at these beautiful pictures in the light of our own Christmas tree is one of my fondest memories. I can’t even begin to describe how vibrant and detailed these pictures are—you will not miss the text, because the pictures will be telling you a story as you look at them. If I was using it in a church setting, I might use it in a small Sunday school class, so the children could see all the pictures up close and talk about all the details. You could also get the children to tell you about each picture and see if they make connections to your church or their family’s Christmas celebrations. In a worship setting, you might display one or two of the images to talk about during the service. This book has Christian elements, without overtly telling the story of Jesus. But one picture shows the town asleep, under snow, as one star shines brilliantly in the sky, and we are reminded that the story of joy and redemption and Jesus coming into the world is told in all kinds of places: little towns called Bethlehem, sleepy towns covered in snow, and in the all the big and small places we call home. Sara Anne Berger, a Union Presbyterian Seminary graduate who wrote a quarter of Lectionary Links for us, was happy to share this memory of one of her favorite childhood Christmas books. It’s another that is out of print, but check out the usual places to find good used copies. Christmas! by Storypath is licensed under a Creative Commons Attribution-NonCommercial 4.0 International License.